This post was inspired by Laura over on my Facebook page posting the excellent question: "Can you address what we can legally do when we see an animal trapped in a hot car in this heat? Can one legally smash the windows out?" Thanks Laura for the great question, as my favourite questions are the ones I don't immediately know the answer to. Here I did a little research for my reading public. With temperatures hitting record highs throughout North America, this is a topic we all increasingly hear about in the news. For children left in a hot car, there would be little legal doubt that you could intervene to save them from harm. But because animals are still considered to only be property in most jurisdictions, the legal situation of intervening to save them is more complicated. I found lots of folks online doing great work to raise public awareness about animals in hot cars. LA County in California has a Hot Cars Campaign in English and Spanish, including a Facebook page. The sometimes controversial PETA has a series of excellent and very reasonable hot cars materials, including even a campaign targeted a law enforcement officers to be careful when leaving K9 partners in police vehicles. And the RSPCA (in the UK) has a good list of tips concerning dogs in hot cars, including how to offer first aid. The best way to answer Laura's question is for me to suggest a series of escalating measures, as increasing legal risk to the person intervening. 1. Call the police, or better yet your local animal control/SPCA enforcement unit. Almost all jurisdictions have laws on the books preventing cruelty to animals. While what amounts to cruelty unfortunately various a lot by jurisdiction, and is subject to lots of legal debate, hopefully most of us could agree that a slow and painful death from heatstroke amounts to cruelty - whether intentionally or just negligently caused. It's the animal control authorities and police who will have the statutory powers to intervene to save an animal, including breaking a window in a vehicle, and seizing the animal. Statutory powers mean that the legislators have empowered them, by virtue of the legislation they are appointed under, to do certain things to aid animals and take actions against the owners of mistreated animals. The rest of us regular citizens don't possess those powers. They will also usually be granted a certain degree of immunity under legislation for their actions, so that it is difficult (though not impossible) for an animal owner to successful sue them for actions they have taken. 2. 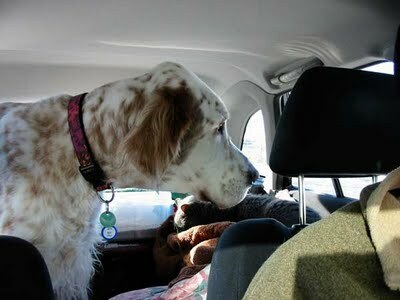 Try to see if the doors to the vehicle are unlocked so that the animal can be let out. Here at least you would not be damaging anyone's property. Though if you do let the animal out, you might be legally responsible for its care until it is either returned to its owner or turned over to the authorities. Thus try to make sure you have a way of gaining control over the animal prior to opening a door, in order to prevent the animal from being injured by traffic or running away. If you do take this course of action, you should ideally have a witness present who can verify that you didn't take anything from the vehicle, and that the weather and condition of the animal clearly indicated the animal needed immediate aid. Any legal proceedings against you here are unlikely. 3. As an absolute last resort, you could break a window to save the animal, but you do need to be prepared for civil and possibly even criminal consequences. Because animals aren't people, even though cruelty to animals may be an offence, that doesn't legally empower you to become a one person animal car liberation vigilante army. You would generally be breaking the window without legal authority. The owner of the vehicle could therefore demand that you pay for the damage, and possibly pursue you in small claims court if you did not. It is even possible that you could be charged with criminal mischief, which at least in Canada is defined under s. 430 of the Criminal Code as wilful destruction of property. Sure you might be destroying the property for a good reason - to in essence save the life of other "property" - but still isn't really an excused. Hopefully here the police or prosecution would exercise their discretion, and not pursue any charges, thus I think the main risk is civil liability - which hopefully wouldn't be too great in value. Again, a witness (or two) would help. Ideally, taking a temperature reading inside the vehicle (although I don't think there is yet an app for that) would be best. Apparently, the thing to not do is tell your boss that you will only tell the police and not your employer when a dog is left in a car. Otherwise, you get yourself fired.